Donations to the 2015 Catholic Services Appeal are earmarked for priesthood formation, Catholic education and a host of ministries that focus on both the spiritual and temporal needs of God’s people in the Archdiocese of St. Paul and Minneapolis. CSAF funded the cost of tuition and room and board for 32 seminarians (approximately $30,000 each), who come from parishes in the archdiocese. Funded the cost of tuition for 27 college seminarians (approximately $10,000 each) from parishes in the archdiocese. Funded the salaries for 13 Catholic priests who serve as chaplains at 15 hospitals within the archdiocese. Provided funds used by the ministry for stipends for deacons and other ministers who serve in 32 prisons, jails and correction facilities in the 12 counties of the archdiocese. Funding for programs that serve more than 35,000 individuals annually. Grants were given to 10 schools that have significant unmet financial need so that they may continue to operate. Most of the schools serve communities in great financial need within the central core of the Twin Cities. The 10 schools serve more than 2,000 students. Grant to ministry provides services for women in the archdiocese. Provided 357 scholarships of $2,500 each to students in need who attend one of 11 Catholic high schools within the archdiocese. Grant to the organization to provide Catholic ministry on college campuses within the archdiocese, specifically the University of St. Thomas, the University of Minnesota and Carleton College. Funded 30 percent of the operating budget of the Catholic ministry that serves 2,500 Catholics at the Minneapolis campus each year. Funded ministry that operates at 23 parishes through 12 programs, including Latino Catechetical Institute, Biblical Institute, Pastoral Leadership Institute, Archdiocesan Latino Family Day and marriage preparation retreats. Supports ministry that operates eight programs at St. Gichitwaa Kateri parish in Minneapolis, including a youth leadership program, American Indian Cultural Camps, religious education, confirmation and baptism programs, and the Miigeweyon Hearse Project. Funded evangelization outreach, including the Rediscover: event attended by more than 5,000 people. Funded the costs of 47 ministries run by the office that serve more than 4,000 individuals. Programs include extensive marriage preparation offered to all engaged couples, Project Rachel post-abortion assistance, the Life Fund for pregnancy financial assistance, Totus Tuus, a Catholic youth program, plus Archdiocesan Youth Day, the day-long evangelization event that draws more than 2,000 teenagers. Funded the ministry at Our Lady of Mount Carmel parish in Minneapolis that provides sacramental preparation, retreats for both the hearing impaired and their caregivers. Funded most of the annual budget of the archdiocesan mission parish in Venezuela. The parish staff of eight serves a population of 65,000 in 11 barrios (neighborhoods) with the sacraments, sacramental preparation, liturgies in the parish church and several chapels in the barrios, a soup kitchen, medical and dental clinics and a medical laboratory. In 2014, CSAF returned approximately 20 percent of the appeal’s funds to more than 140 parishes and will give approximately another $346,000 in May when appeal totals are final. 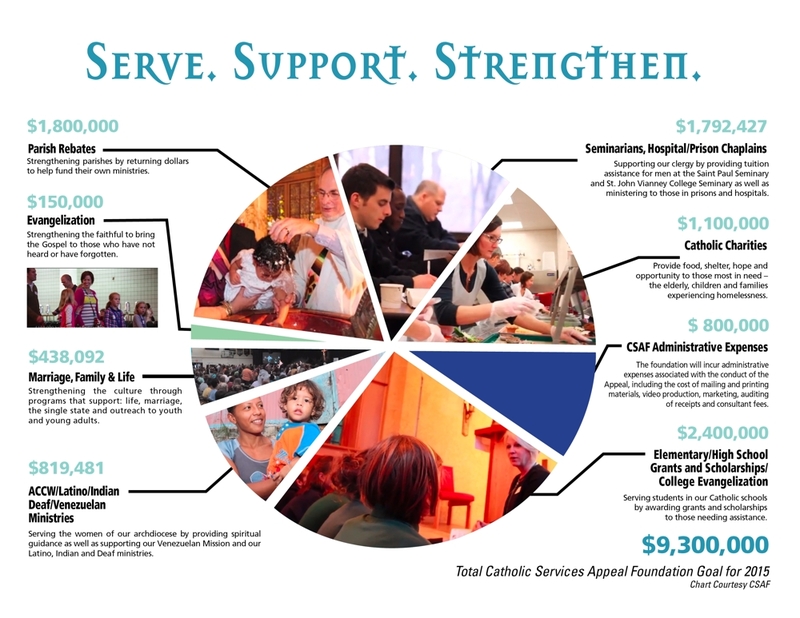 A three-page preliminary report of the activities of the Catholic Services Appeal Foundation in its first year–including an unaudited breakdown of every expense–is at csafspm.org. An audit is under way.